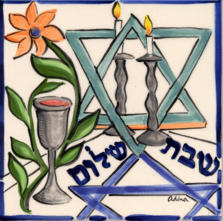 A STAYING STRONG TIP: Observing the Shabbat has been a major blessing becoming a Jew (I am a convert. bestowed on me. No matter what your beliefs about a higher power, a day devoted to a simpler life is strengthening. To me that means thinking about what matters, not spending money, not working on any commercial ventures, not using my beloved computer, turning off the cell phone, connecting with friends, nature, my G-d. STAYING STRONG TIP ADDED VALUE: Set aside one day a week for no (or minimal) travel, and no turning on the tv, radio, or computer and turning off your cell phone. It saves gas, reduces your carbon footprint, might solve the energy crisis, stop the heating up of our planet. Try it you might like it. And yes, one of my ongoing cranks is how much harder it is on today’s parents to do these things. David and I were both at home and it was hard enough, but it was during those years our only job. So if you are working at more than being a parent, don’t guilt yourself if you can’t do as we did. Do try to find some unconnected family time and the same for you. Start small and spread. Also if you have found ideas that get your family unconnected and spending quiet or play time together then share. Also share if you’ve found a way to carve out some of the same for just you. PRACTICE KINDNESS Share this post with others who might find it of value. Kindness gives to the giver as well as to the receiver. This entry was posted in Self Care and tagged A day of rest, parenting, parents, postaday, postaday11, Practiicing kindness, Self care, Shabbat shalom, Staying Strong Tip, Thinking about what matters. Bookmark the permalink. Thanks for the reminder. I love the Ovid quote.